Following a hugely successful, sold out inaugural year in 2017, Goldenvoice’s Arroyo Seco Weekend Festival has revealed more details on this year’s festival. Taking place at Brookside at the Rose Bowl in Pasadena, only a couple hours communte from San Diego, Arroyo Seco Weekend is a world class cultural affair, with a stellar music line up that includes Saturday headliners Neil Young + Promise Of The Realand and Jack White, with Sunday headliners Kings Of Leon and Robert Plant and the Sensational Space Shifters, as well as a food lovers' paradise. 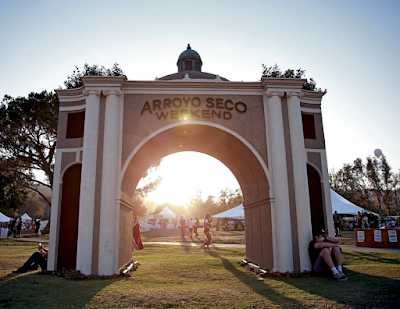 In addition to an incredible lineup of musical entertainment, Arroyo Seco Weekend Festival goers will find an array of sought-after dishes and award-winning restaurants from Los Angeles and Pasadena’s impressive culinary communities. The selection offers a wide range of cuisine, from classic Italian dishes, authentic Mexican, Korean BBQ, to gluten-free and vegan options celebrating Los Angeles' melting pot of a food scene. Newest additions to the food and beverage program include Los Angeles staple Barrel & Ashes, along with the beloved Burritos La Palma, and the new and exciting Chilola's Fine Filipino Tacos by Chef Michael Hung, and Chef Michael Mina’s Cal Mare, and others. Pasadena’s acclaimed Kidspace Museum will also return to the festival with a tent of activities to keep children entertained. This year, make your own box guitar, jam with the interactive drum circle lead by Rhythm Child, add to the collaborative art project and create your own crafts and concert buttons at the Kidspace Family Jam. And, for the first time, Arroyo Seco Weekend welcomes Pasadena’s The Huntington Library, Art Collections, and Botanical Gardens with an interactive installation of plant and flower biology and NASA Jet Propulsion Laboratory will be on site with an exclusive Intergalactic Travel Lounge. This year also sees the return of Vroman’s Bookstore-curated Little Libraries, scattered around the festival site. Attendees will be able to peruse books relating to Pasadena’s long history as a cultural center. Children 10 and under are free with a ticketed adult. The full musical lineup for Saturday, June 23 & Sunday, June 24 include Belle & Sebastian, Dwight Twilley, Gomez, Hurray for the Riff Raff, Jack White, Jeff Goldblum and the Mildred Snitzer Orchestra, Kamasi Washington, Margo Price, Maxim Ludwig, Neil Young + Promise Of The Real, North Mississippi Allstars, Pharoah Sanders, Pretenders, Seu Jorge, Shakey Graves, The Milk Carton Kids, The Specials, Typhoon, Aaron Neville, Alanis Morrissette, Allen Stone, Capital Cities, Dorothy, Fantastic Negrito, Gary Clark Jr., Irma Thomas, Kings Of Leon, Los Lobos, Margaret Glaspy, Robert Plant & the Sensational Shape Shifters, The Bangles, The Revolution, Third Eye Blind, Tracksuit Wedding, Trampled By Turtles, and Violent Femmes. Tickets to Arroyo Seco Weekend are currently available online starting at $149 for a single day pass and $249 for a weekend ticket. Free day parking will be available at the festival, plus easy access from surrounding areas by Metro Gold Line, or rideshare/taxi to a pick-up and drop-off lot. The festival venue is accessible to pedestrians, and a Bike Valet will be offered. Festival amenities include plenty of shade, water filling stations, lockers, bicycle parking and phone charging stations. Arroyo Seco Weekend is truly Pasadena taking its name from The Arroyo Seco stream, meaning "dry Stream" in Spanish, that passes through Brookside Golf Course and Pasadena from the San Gabriel Mountains. 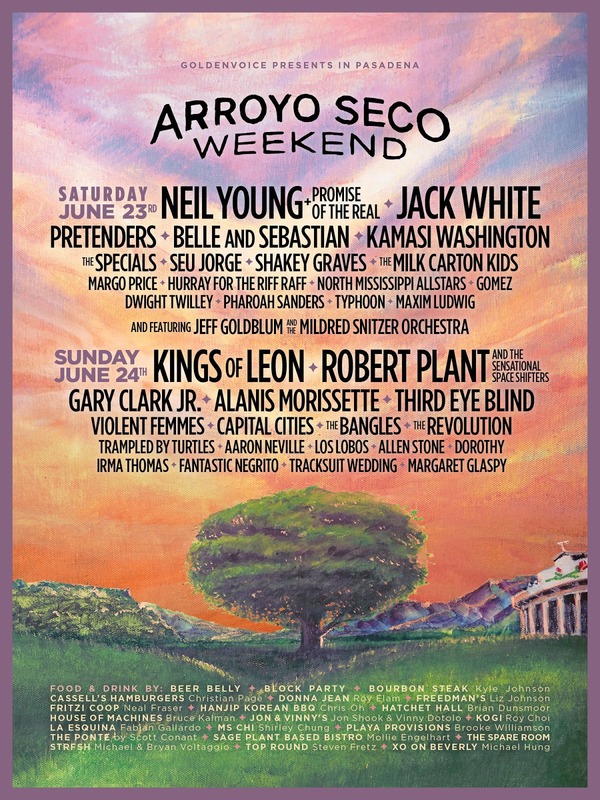 For more information and to purchase passes, visit arroyosecoweekend.com.